'I have a business proposition for you.' Sealed with a million–dollar ring! 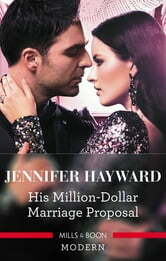 To win the most important deal of his life, Lazzero Di Fiore needs a fake fiancée. He strikes a pact with his gorgeous but guarded local barista Chiara: he'll save her father from bankruptcy if she agrees to wear his ring! But any convenience is consumed by their explosive attraction. Now Lazzero is determined to see his diamond on Chiara's finger – for good!